You started your second turn with no military cards, but you probably drew some at the end. Now it's time to find out what you can do with them. In your first game, the military cards you draw will fall into three categories. Cards marked with a crown in the upper left corner are played as a political action. They allow you to influence global affairs. In your first game, you will have only events and territories. 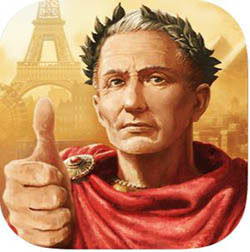 In the full game, you may also use your political action to play aggressions, wars, or pacts. The red cards depicting sets of military unit icons are tactics cards. They can be played during your Action Phase. Military bonus cards can help you when you are colonizing new territories. In the full game, the upper part of the card can be used to defend against aggressions. Make your exclusive tactic available, if you have one. Politics Phase: Play at most one political action. Action Phase: Play your civil and military actions. End-of-Turn Sequence: Follow the sequence printed on your player board. This includes your Production Phase. Your political action is played after you have replenished the card row, but before your Action Phase. You do not have to play a political action. In your Politics Phase, you may play at most one political action. Political actions include playing aggressions, pacts, and wars. None of these are in the decks for your first game. Your only possible political action is to prepare an event, which you can do only if you have an event or territory card. Event and territory cards are not played directly from your hand. Instead, they are placed face down on the future events deck. The event is known only to the player who prepared it. As the game progresses, the future events deck becomes the current events deck. A current event takes effect when it is revealed. Choose a green military card with the symbol in the upper right corner from your hand. Place that card on the future events space, face down, without showing it to anyone. Score culture equal to the level of the card. Reveal the top card of the current events deck and evaluate it. The first player who prepares an event will put the card on the empty future events space. It thus becomes the future events deck. The player scores 1 culture point (assuming it is an Age I card). Then the player reveals the top current event, which is one of the Age A events placed there during setup. The second player who prepares an event will put it atop the card on the future events space, score culture, and reveal the next current event. When the last card of the current events deck is revealed and evaluated, the future events deck is shuffled and put on the current events space, thus becoming the new current events deck. After that, the next player to prepare an event places it on the now-empty space and reveals the top current event. This time it is one of the events that a player prepared on an earlier turn. If you prepare events, then you can plan your strategy to take advantage of them, although you cannot be certain exactly when they will be revealed. 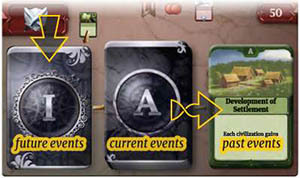 As the game progresses, events from different ages may be put in the same future events deck. When the future events deck becomes the current events deck, it should also be sorted so that cards from earlier ages will be revealed before those from later ages. Shuffle it as usual, then sort the deck face down. A current event is revealed whenever a player uses his or her political action to prepare a future event. The current event is evaluated immediately, before that player continues his or her turn. Events with "Territory" in the name are territories that can be colonized, as explained on the facing page. Otherwise, follow the text. Follow the text on the card. Then put the card face up on the past events space. Cards in the past events pile will not enter the game again. The first several events were prepared during setup. These are all positive, and all players may benefit from them. If the event requires players to make a decision, they do so in order, starting with the one who is currently playing his or her turn. If the event specifies an action that you would normally perform during your Action Phase, you perform that action according to the usual rules, except that you pay no actions for it. If it allows you to build something for free, then you also pay no resource cost. Tip: Some events are beneficial only if you have an unused worker. It is a good idea to have an unused worker at the start of round three. If an event says you may "increase" your population, that means you must follow the rules for the action and pay the food cost. If an event says you simply "gain 1 population" then you just move a yellow token from your yellow bank to your worker pool without paying any costs. Once all the Age A events are evaluated, the events prepared by players start to appear. These may be positive, negative, or both. Some of these events may affect only certain players. If an event talks about the strongest, the two strongest, the weakest, or the two weakest civilizations, you compare their strength ratings. In case of a tie, the player whose turn it is, or the player who is closer to that player in turn order, is considered to have more. To help you remember this rule, consider this: The player currently taking a turn is in position to increase his or her strength first. So that player has the strongest position. The player whose turn just ended could have increased strength, but didn't, so that player is weakest. Tip: Many events help the strongest players, punish the weakest players, or both. It is not a bad idea to end your turn with higher strength than the other players. This may lead to a cold war even in a game with no direct attacks. The same tie-breaker applies when deciding who has the most culture points. However, having the most culture points is sometimes a disadvantage. Also, there is a special rule for a two-player game: If a card refers to the two strongest or two weakest players, read it as "the stronger player" or "the weaker player" in a two-player game. Not all comparisons require tie-breakers: If an effect applies to "all civilizations" with the most of something, then all civilizations tied for the most are affected. You do not break ties. As with Age A events, you do not pay actions when resolving a card's effect unless the effect says otherwise. Some effects are explained on your quick reference sheet. Certain cards are explained in the Appendix at the back of the Code of Laws. When a territory is revealed as the current event, all players may compete to see who colonizes it. Players bid to see who is willing to send the strongest colonization force. 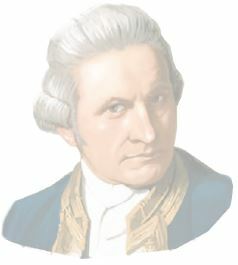 The player who wins the auction sends colonists and takes the colony. Bidding begins with the player who is currently resolving his or her Politics Phase and proceeds clockwise around the table. In turn, each player may bid or drop out. To make a bid, you need to say a whole number higher than 0 and higher than any previous bid. You cannot bid more than the maximum colonization force you can send. (This will be explained later). If you do not bid, then you must pass and drop out of the bidding. If no one bids, the territory card goes to the past events pile. The current event has been resolved. Otherwise, bidding continues around the table as many times as necessary until all but one player has dropped out. That player wins the auction and must form a colonization force equal to or greater than his or her last bid (the highest bid). If you win the auction, you must colonize the territory. It is too late to change your mind. To colonize a territory, you must send one or more military units. The strength of these units forms the basis of your colonization force. You might also have cards in play that give you a colonization modifier, represented by the a symbol . You can augment your force by playing military bonus cards. The colonization value in the bottom half of the card is added to your total. Count the strength of all the units you have sent. If some of these units can be formed into armies, add the armies' tactical strength. (Explained later). Add any modifiers you have from cards in play. You may play any number of military bonus cards and add their colonization value to the total. Effects that modify your strength rating do not apply to your colonization force. For example, Alexander the Great, the Great Wall, and the Warfare technology have no effect on colonization. You must always send at least one unit, even if the modifiers and bonuses alone would be enough to cover your bid. Note: Arenas are urban buildings, not military units. Even though they are workers that contribute to your strength rating, they cannot be sent with your colonization force. Units sent as part of a colonization force are sacrificed - that is, their yellow tokens are removed from their cards and returned to your yellow bank. Any military bonus cards you play are discarded. You put the territory card you won in your play area. From now on, it is referred to as your colony. Each territory card has two effects. The symbols printed at the bottom of the card are the colony's permanent effects. They may affect your statistics as explained in the Updating Your Statistics box on page 11. 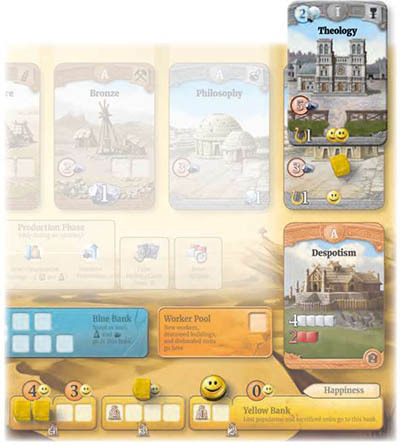 If yellow or blue tokens are depicted, see the Gaining and Losing Yellow and Blue Tokens box on this page. The effect depicted below the card's name is an immediate benefit for the player who colonizes the new territory. When you win the territory, apply the permanent effect first, and then take this immediate benefit. It may give you food, resources, science, culture, or military cards. It may even let you gain population for free. In rare circumstances, you might lose your colony. If you do, you lose its permanent effect, but you do not undo the immediate benefit. That part of the card applies only when the territory is first colonized. You have 25 yellow tokens and 16 blue tokens at the start of the game. Whenever you put a card with or symbols into play, you gain the depicted number of yellow or blue tokens. Take them from the box and put them in the appropriate bank on your player board. If the card leaves play, you must return the depicted tokens from your bank to the box. The symbol works the opposite way. You move a blue token from your blue bank to the box when you put the card in play. You gain a blue token from the box if the card leaves play. There are also some effects and rules that require you to gain or lose yellow or blue tokens. Unlike white and red tokens, your number of yellow and blue tokens cannot be calculated just by looking at the cards you have in play. When you gain a yellow or blue token, take it from the box and put it in the corresponding bank on your player board. When you lose yellow tokens, return them from your yellow bank to the box. If you do not have enough, return all those in your yellow bank but no more. When you lose blue tokens, return them from your blue bank to the box. If you do not have enough, you must also return some from your technology cards to make up the shortfall. 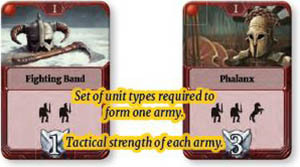 Tactics cards allow you to group your units into armies, which give your civilization additional strength. Each player may only have one current tactic. If you have one, it is marked by your tactics standard. At the start of the game, everyone's tactics standards are in the common tactics area of the military board and no one has a current tactic. You choose your current tactic by playing a tactic or copying a tactic during your Action Phase. You may perform at most one of these actions per Action Phase. Once you have chosen a current tactic, it will remain your current tactic until you choose a different one. You may play a tactics card from your hand during your Action Phase. Pay 1 military action. (This is depicted in the upper left corner of the card). Put the card in your play area. Put your tactics standard on it to mark it as your current tactic. If you already had a current tactic, it stops applying to you. Your armies are reorganized according to your new current tactic. While your tactics card is in your play area, no one else can use it.But every civilization has shrewd generals, and it doesn't take long before everyone knows about your new trick. After you replenish the card row and before your Politics Phase, you must move any tactics card in your play area to the common tactics area of the military board. In other words, the tactic remains exclusive to you for only one round. Your tactics standard remains on the card, so it is still your current tactic and its contribution to your strength rating does not change. The only difference is that now anyone can copy it. There is no limit to the number of tactics cards that may be in the common tactics area. Organize them in any suitable way. Once a tactics card is in the common tactics area, it becomes possible to copy it during your Action Phase. Choose any tactic in the common tactics area. Pay 2 military actions (as depicted on the military board). Move your tactics standard to the chosen card. It becomes your current tactic. It does not matter how a tactic became your current tactic. Copied tactics have the same effect as tactics you played yourself. In the common tactics area, multiple players can have their standards on the same tactics card. They all use it without limitations. Some tactics cards in the common tactics area may have no tactics standards if all players abandon them. They remain on the board, available to be copied. Note: Copying a tactic costs you 2 military actions, even if it is one you originally played. If you have a current tactic, your military units organize themselves into armies. Each set of units makes one army. If you can make multiple sets, you make multiple armies. The tactics card specifies how many of each type are required to make one set. Each army consists of a set of units depicted on your current tactics card. A unit can only be part of one army. Each army has a tactical strength that is added to your strength rating. This is in addition to the contributions of the individual units. You don't spend actions or move any physical pieces to group your units into armies. They group themselves automatically. Just do the calculation and update your strength rating. Age II and Age III tactics cards depict 2 tactical strengths. The greater value is for normal armies and the lesser value is for outdated armies. An army is outdated if any unit in the army is 2 or more levels lower than the tactics card. For example, if you are using an Age II tactic, any army with an Age A unit is outdated. An outdated army has the lesser tactical strength depicted on the tactics card. Your armies automatically form sets in the way that provides maximum tactical strength. Note: When determining whether your army is outdated or not, you consider the age printed on the tactics card, not the current age. The units sent to colonize a territory may form armies, too. The tactical strength of these armies contributes to the colonization force. If you want your population to happily work for you, you also need to think about them. During the game, you will be able to increase your happiness rating in various ways, usually by building specific urban buildings or by completing certain wonders. As you do so, your happiness rating marker will move along the top of your yellow bank. Below each circle of your happiness indicator is a specific subsection of your yellow bank. When a subsection is emptied, that means you need more happiness to keep everyone happy. If you don't have enough happy faces, you will have discontent workers. Your number of discontent workers is equal to the number of empty subsections to the left of your happiness marker. After you increase your population for the second time, subsection 1 of your yellow bank is empty. You need at least 1 happy face to keep your people happy. You can either increase your happiness rating (usually by building something) or accept the fact that one of your workers will be discontent. If you manage to increase your happiness by one or more, everything is okay for now. Your happiness marker is above the empty subsection, and everyone is happy. On the other hand, if you do not give your people some happy faces, you will have a discontent worker. You can represent this by taking one of your unused workers and putting it on the circle above the empty subsection. This worker still counts as an unused worker, and it can be used just as if it were in the worker pool. However, it is not in the worker pool for a good reason - to remind you that you have a discontent worker. If you do not have enough unused workers to cover each missing happy face, you will face an uprising at the end of your turn, which means that your civilization will not produce anything. You have two discontent workers. However, you have only one unused worker. That means one of your discontent workers must work. This will lead to an uprising if you do not correct the situation. You may upgrade your temple. This will increase your happiness rating to 2, and you will have only one discontent worker. Your unused worker is enough to cover the missing happy face, so you will face no uprising. You may build a new Age I temple. The worker on the happiness indicator is an unused worker, so it can be used for this. This will increase your happiness rating to 3, which is just enough to keep everyone happy. You will have no discontent workers. You may increase your population. That will give you one more worker, without emptying subsection 4. You still have two discontent workers, but now you have a second unused worker. You put it on the second missing happy face to show that discontent workers do not outnumber unused workers. There will be no uprising this turn, but you should find a more permanent solution. If you increase population again, you empty another subsection and the new worker goes right on the missing happy face space. You could also get an unused worker by destroying a farm, mine or urban building, or by disbanding a military unit. That's not a very good option. Letting it go and accepting the uprising is the worst option, and you are forced to do so only rarely. As your civilization grows, all steps of your End-of-Turn Sequence become relevant. Your number of red tokens defines the maximum number of military cards you are allowed to have after this step. Once you have decided which military cards to discard, the rest of your turn is automatic. That is, it requires no more decisions. The next player may start his or her turn as soon as you finish discarding. Of course, if anything happens on that player's turn that interacts with your civilization, that turn will need to pause until you finish your End-of-Turn Sequence. If you have more discontent workers than unused workers, you face an uprising and skip the Production Phase. Uprisings are explained on the previous page. Essentially, if your civilization is forcing unhappy people to work, they get so mad that they stop producing for you. Skipping your Production Phase is the only consequence of an uprising, but it is definitely a consequence you want to avoid. A lot of good things happen in your Production Phase. As always, advance your points counters according to your science and culture ratings. If, through brilliant play, your points exceed the amount that can be depicted on the scoring track, flip the counter over to represent that you have that many points and start counting again from zero. For example, a flipped-over culture points counter on space 10 represents 160 culture points. Corruption happens if you try to stockpile too much food and resources. An unfinished wonder can also contribute to corruption. When there are extra food and resources lying around, someone always finds a way to make them disappear. If one or more negative numbers in your blue bank are uncovered, the leftmost uncovered number is the amount of corruption you face. If they are all covered, there is no corruption. You face no corruption if you have at least 11 blue tokens in your blue bank. Example: In this case, you face corruption of -4. During this step, you lose resources equal to your corruption. If you do not have that many resources, you lose all your resources and make up the difference by losing food. In other words, you move blue tokens representing that many resources from your mine technology cards to the bank. And if you don't have enough, you move blue tokens from farm technology cards. Don't forget that one blue token can represent more than 1 if it is on a higher level technology card. Tip: You can avoid corruption by good planning, by gaining cards that give you more blue tokens, and especially by developing advanced farm and mine technologies. Higher level technology cards can store more food and resources while using fewer blue tokens. As always, for each worker on a farm technology, move one blue token from your blue bank to that card. A worker on a higher level card still produces only one blue token, but the token is worth more food. If one or more negative numbers in your yellow bank are uncovered, the leftmost uncovered number is the amount of stored food your civilization consumes. If they are all covered, there is no consumption. Example: In this case, you consume 3 food during the Production Phase. You must pay that much food. If you do not have enough, pay all that you can and lose 4 culture points for each A you did not pay. Note: It is unlikely that you will face a food shortage early in the game. Consumption happens after food production, thus you should have enough, unless you did something unwise like destroying all your farms. Later, however, consumption increases. If it outgrows your food production, you should try to fix the problem. As always, for each worker on a mine technology, move one blue token from your blue bank to that card. A worker on a higher level card still produces only one blue token, but the token is worth more resources. Your blue bank holds blue tokens. Some cards and effects may alter your number of blue tokens. You take blue tokens from the box or return them to the box only in these special cases. During your Production Phase, you move blue tokens from the blue bank to your farm and mine technology cards, one blue token for each yellow token on the card. A blue token on a farm or mine technology card represents the amount of food or resources shown on the bottom of the card. Blue tokens can represent food or resources even if the card has no workers. You pay food or resources by moving blue tokens back to the blue bank. When paying, you are allowed to make change by moving a token to a lower value card or by exchanging a token on a higher value card for multiple tokens of lower values. You never make change by moving tokens from lower value cards to higher values. Blue tokens are also placed on unfinished wonders to represent completion of each stage. The blue bank is always filled from left to right. If a red negative number is uncovered, it is your civilization's corruption. Corruption has no effect until your Production Phase. During the corruption step, you must pay that many resources. If you fall short, you must make up the difference by paying food. Draw 1 military card from the current military deck for each unused military action. Your draw them even if the resulting number of cards exceeds your hand limit. You may never draw more than 3 cards this way. If you have more than 3 unused military actions, you draw only 3 military cards. If the current military deck runs out, shuffle the discarded military cards of the corresponding age to form the new military deck. In your first game we do not use Age III cards; thus in Age III, you draw no cards. Your hand limit for civil cards is your number of white tokens. You are not allowed to take a civil card into your hand if you are already at your hand limit. However, even if you are at your hand limit you can still take a wonder. Wonders go directly into play without entering your hand. Your hand limit for military cards is your number of red tokens. Unlike the limit for civil cards, your military cards hand limit never prevents you from drawing military cards. You only check your hand limit for military cards during the first step of your End-of-Turn sequence. If you exceed the limit at that time, you must discard down to the limit. Later in the sequence, when you draw new military cards, you may exceed the limit again. The last step of your turn is to move all spent actions back to your government card.